The year is 2525. The United Nations are the target for a major covert attack by terrorists. Their devious intentions are to destabilize defense systems and to overthrow the allied governments. This covert action is the evil demise of the international terrorist known as "X". The CIA has just received information which indicates that "X" is near comp- letion of an ultimate war weapon which will enable him to begin his attack. The CIA has sent out their best agents in order to undermine his criminal espionage but all have failed. Finally, they call upon rookie agent Rachel (Code HE03) who has been specially trained in international espionage. Much time passes and she has not yet returned. For fear that "X" has her in his evil grasp, the CIA calls on an unofficial agent in a last desperate attempt to save the world from utter chaos. This agent's code name is SSH "Super Spy Hunter". --From the NES Super Spy Hunter instruction manual. 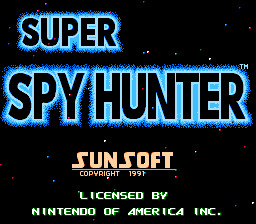 Play Super Spy Hunter Now!